It’s beginning to look a lot like Christmas! So, tis the season for malls, shopping, wrapping paper, gifts, bows, and ribbons! Maybe you prefer online shopping in your bathrobe with the internet, eBay and UPS. Or perhaps you prefer handmade gifts, baked goodies and homemade cards. But no matter how you look at it, this is the season for gift giving. Why? Most people probably give out of tradition. You are supposed to buy gifts at Christmas. Right? It is what has always been done. However, our family likes to look at gift giving a little differently. While it is a tradition at our home, it is one with a purpose. We give gifts as a reminder of the greatest gift ever given to mankind. I must admit that I love giving gifts to my children. But guess what? So does our heavenly Father! “If ye then, being evil, know how to give good gifts unto your children, how much more shall your Father which is in heaven give good things to them that ask him?” Matthew 7:11. But toys and trinkets get broken, clothes get worn out and outgrown, electronics lose batteries and stop working, and the latest fad becomes next year’s obsolete. So I ask myself what can I give my children that will last? What type of gifts can I give that have true value? 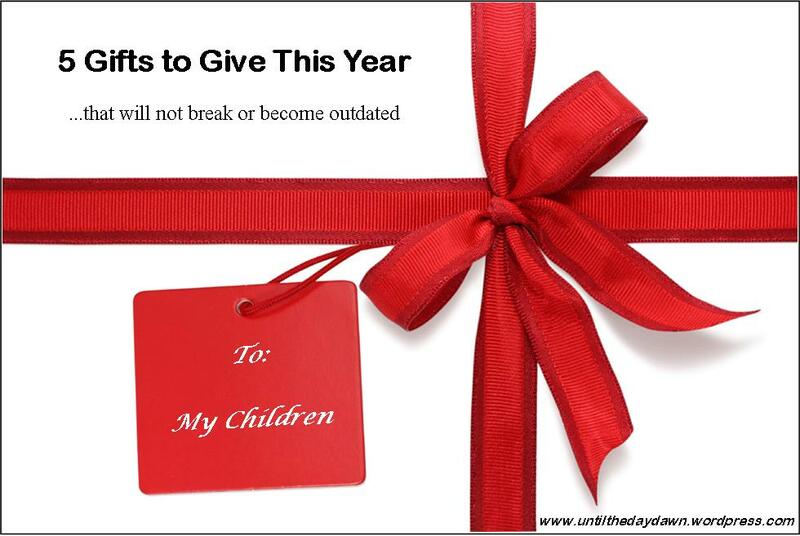 Listed below are 5 gifts that we can give our children that will never become broken or outdated. In a world of busyness one of the most wonderful gifts we can give our children is time with them. December is probably the busiest month of the year for us. Between Thanksgiving and Christmas we go nonstop. There are people to visit, parties and programs to attend, Christmas cantata’s to practice for, gifts to make, shopping to do, etc. But life is short. “Whereas ye know not what shall be on the morrow. For what is your life? It is even a vapour, that appeareth for a little time, and then vanisheth away.” James 4:14. This truth is especially evident when it comes to children. They do not stay young forever. They grow up fast. As parents we only have a short time to invest in our children. We need to slow down and give our children something that will matter – time. Time with us, time to play games, time to talk, time to come apart from the world, time to meditate upon God, time to read together, and time to be a family. I have heard it said that the quantity of time does not matter as long as you give your children quality time. This is not true! Research has said that parents spend on average 3.5 minutes a day in meaningful conversation with their children. How sad! However, the average child watches 1,500 hours a year of TV. I guess if we want Hollywood to raise our children then this statistic would not bother us. But it bothers me. Turn off the TV and spend time with your children. Read to them at night, pray with them, and sing songs. When they grow up and look back at their life these are the things they will remember. This describes a home filled with peace. What a superb gift to give our children. Another gift that is so overlooked in our modern culture is love in the home. It is given that we should love our children, but one of the best ways to love our children is to love God first and our spouse second. This speaks volumes to our children. Theodore Hesburgh is credited for saying, “The most important thing a father can do for his children is to love their mother.” The focus of the family should be on the marriage. When parents are united the children are blessed. In addition, a strong marriage will strengthen our children’s faith as it is a testimony to the world for God’s glory. “My little children, let us not love in word, neither in tongue; but in deed and in truth,” 1 John 3:18. While giving gifts let’s not forget the gift of hard work & diligence. Society will tell a child that you should do as little as possible to get as much as possible. It is this fallacy of thinking that has leads to a lazy and entitlement mentality. But, give your children the gift of learning how to work hard and they will always be able to thrive. In addition, it is pleasing to the Lord. “And whatsoever ye do, do it heartily, as to the Lord, and not unto men;” Colossians 3:23. Another character trait this is desperately needed in today’s society is inner beauty, especially when it comes to our daughters. Godly women are not born, but raised. Many mothers concern themselves over whether their daughters have fashionable clothes and the latest styles. Many would be alarmed if their daughters wore dirty clothes. But how many mothers care if their daughter has a filthy heart? To teach and train our daughters about inner beauty that is acceptable to God is a divine gift we can give. “Favour is deceitful, and beauty is vain: but a woman that feareth the LORD, she shall be praised,” Proverbs 31:30. There are many gifts we can give our children. But one that is of utmost importance is to give your children biblical standards to live by. As Christian parents we should not want for our children what every other parent wants. We shouldn’t hold them to the world’s standards but to God’s standards. Do you want your children to make the team? What about them making it into the Lambs book of life? Do you want them to get a good education? What about them being educated in the Word of God? Do you want them to be true and loyal to their friends? What about your children being faithful to the Lord and His Church? Do you want your children to be popular? What about them being peculiar? God’s ways are always higher. “And be not conformed to this world: but be ye transformed,” Romans 12:2a. Christian parent, there are many worthwhile pursuits in this world, but few rise to the level of training our children to follow the Lord, to love Him with all we are, to treasure His Word, and to keep His commandments. When we do this we have given our children gifts that never tear up, get worn, or get taken away. Your posts are such a blessing to me (usually convicting) and I really appreciate your stand for Truth! Thank you for your faithfulness to the Lord and His Word. Thank you CarolSue! Blessings to you.